Dani Rabaiotti – Does it Fart? On Wednesday 1st November we are thrilled to have Dani Rabaiotti talking about animals farting. Yep – Toot. Parp. Poot. Pfirt. Psthhhp. Pop. Pfeeeeew. Pthzzzzzz. These are just some of the noises animals make when they fart. Find out which animals fart, and why, as well as how there came to be an entire book dedicated to this topic. Dani is a PhD student at the Zoological Society of London, and author of ‘Does it Fart? – The definitive guide to animal flatulence’. Dani will be chatting about how she went from studying climatic impacts on African wild dogs to becoming an author of a science humour book on the theme of farting animals. She will also be covering a range of animal fart facts, anecdotes, research experiences and discussing the scientific literature on the topic (of which there is surprising amount!) along the way. If you fancy buying Dani’s book it will even be available on the night and if you ask really nicely Dani might fart on it for you (or at least sign it). On Wednesday 5th April we are delighted to welcome Dr Fiona Nairn Scott who will be talking about fireproofing an iconic building. Fiona has a background in Materials Engineering and is now a Principal Consultant with a major Built Asset consultancy firm, with experience in the automotive, aerospace and rail industries, in both the UK and overseas. Fiona’s last project was part of a major refurbishment of an iconic building with national significance. She will discuss issues around maintaining and retaining historic features, while at the same time making the building fit for the 21st Century’s needs – which is no small undertaking! Gail Austen – Citizen Science: What Makes An Expert? On Wednesday 2nd March we’re pleased to have Gail Austen speaking about the important and evolving role of citizen science. Gail is studying towards a PhD in Biodiversity Management at the Durrell Institute of Conservation and Ecology (DICE), University of Kent. She has an MSc in Taxonomy and Biodiversity from Imperial College, having been swayed by the course being hosted at the Natural History Museum, where she also volunteered. Prior to this (overlooking a stint in finance), she worked for a Local Records Centre and become involved in local conversation, including spending the last six years as Chair of the Kent Reptile & Amphibian Group (KRAG). Gail has a passion for UK wildlife and is an advocate of amateur naturalists and citizen science. It is generally accepted that there has been a decline in field biology skills, with some drawing a parallel between the ability to identify flora and fauna with ‘traditional country skills’. There are a number of specialists concerned with the naming and cataloguing of live, dead, extant and extinct specimens, both as part of their job and in a recreational capacity. However, there have been questions raised over the accuracy of the data collected in a ‘non-scientific’ manner, but in order to answer questions about the natural world, the reliance on citizen science and volunteer collected data is increasing. Using established methods used in face recognition studies in psychology, my research investigates accuracy in visual species identification, what makes an expert, and whether we can improve these skill sets as a legacy for generations to come. After nearly two years of PubSci in the Upstairs bar at the Ritzy in Brixton, we have decided to move on. The Ritzy was a great place to run the events thanks to the helpful staff, but noise from the downstairs bar was an ongoing issue and we are moving on in search of slightly quieter pastures (we were also keen to find a venue with more ales than lagers). 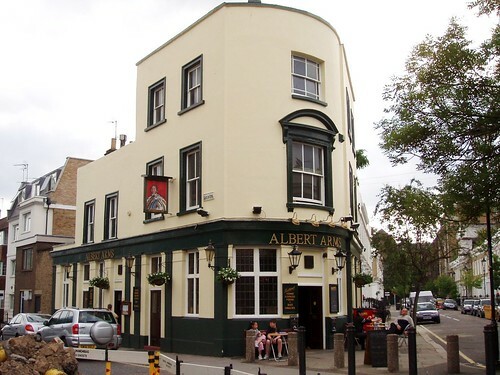 The new venue for PubSci is the Albert Arms, which is a traditional boozer (with some proper beers) located in Southwark, just a short walk from Elephant & Castle tube. The first event at the Albert will be Claire Benson telling the stories of fire and explosions from the 19th century that captured imaginations, changed the face of the planet and the very way we see the cosmos. So, if you want to know how spontaneous combustion led to the London Fire Brigade creation, how explosives actually saved many lives, and how the development of 1 small piece of laboratory equipment lead to us understanding the very makeup and expansion of the universe, then join us at 6:30pm on Monday 14th January (yes, the day before the pub quiz – our last event in Brixton). We hope you like the new venue!